Of all the authors I'll ever meet, Celeste Bradley will always have a place of honor in my heart. Why? Because 5 years ago, I served her a cup of coffee late one night and when she commented that she needed the caffeine because she was pulling an all-nighter to finish writing her book, I enthusiastically exclaimed that I, too, was a writer. I was. I had seven chapters on my first manuscript finished. She was a multi-published author. We weren't exactly on the same playing field. But, she treated my statement with respect and even offered to read my chapters for me, something I would never have dared to ask for. After she read, she was again gracious enough to meet with me personally and rip my book to shreds. Well, almost all of my book. She did point to one line and say, "I was going to be kind, until I saw this line and realized you're the real thing. So, the gloves came off because you have talent." I took notes, listened carefully, and learned valuable lessons like what were cliches and how to avoid them, and how to not head-hop (change POV) fifteen times per page. She also gave me excellent advice on how to pursue publication and where to find other authors to network with. I've always been immensely grateful. She shaved years off my journey to publication with one gloves-off conversation. 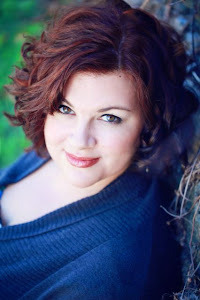 So, when I emailed her and asked if she'd be willing to be interviewed on my blog, I was so thrilled when she said yes! Celeste's books are full of fun, intrigue, escapades, and romance. Here's a peek at her latest, A ROGUE IN MY ARMS. The Runaway Brides trilogy had the working title of "Three Lords and a Baby." One day a tiny girl, Melody, is dropped off on the steps of Brown's Club for Distinguished Gentlemen with nothing but a note claiming that her father is a member of the club. Since most of the club's members are long past the sowing of their oats, the finger seems to point to the youngest three members. Lord Aidan de Quincy, Sir Colin Lambert, and Lord Jack Redgrave. 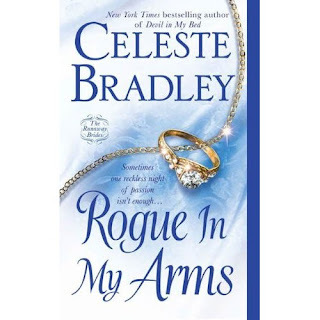 In the second book, ROGUE IN MY ARMS, Sir Colin Lambert is searching for the stunning actress Chantal, who rejected him so soundly that he has never looked at another woman since. If he can offer her his new title and wealth, and make their child legitimate, surely she will wed him now? But Chantal has disappeared and Colin must hire saucy theater seamstress Prudence Filby, to help him in his search. However, plain and common Pru is really a lady in hiding, protecting her young brother from greedy relations who would steal the inheritance he will receive when he comes of age. Now out of work and broke because Chantal fled town without paying her, Pru and her brother join the search for the flighty actress. The journey takes them from London to Brighton to Bath, a mad race to catch up with Chantal before she weds another. On the way they encounter scoundrels, players and bandits, along with a string of other lovelorn men hell-bent to find Chantal! When Pru realizes that Colin is a man she could truly love, she can't bear that he still adores the selfish Chantal. When Colin realizes that Pru is so much more than he first believed, he realizes that he must make a choice. Wed the woman he loves and doom his child to permanent illegitimacy, or try to make a family with the mother of his child? Celeste, being the adventurous, romantic sort, decided to take on the inimitable Captain Jack Sparrow for her interview. Now that you know who's who, let's take a look at the awesome cupcake my hubby made for Celeste. 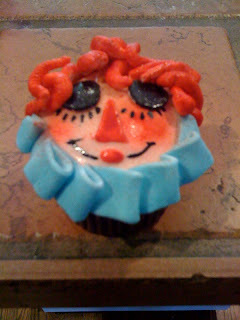 As Melody is the central figure causing mayhem and craziness for the three bachelors in the Runaway Brides trilogy, Celeste asked for a Raggedy Ann cupcake to represent little Melody. So, without further ado, I give you the cupcake and Celeste's interview with Captain Jack. I'm a pirate. Definitely. I'm not really a member of anything. I can't bear politics. Or committees. I can't stand it when people talk things to death instead of doing something. It makes me froth at the mouth with impatience and I usually just go ahead and get it done while they're still talking! I guess you could say I don't play well with others! 2. Hm. I bet I could get you to play well with me, my darling. What’s your favorite thing to do in Tortuga? Me. Hammock. Umbrella drink in a coconut. Go away. 3. You. Me. Hammock. Umbrella drink. Sounds very tempting. I’m offering you free passage aboard my ship to anywhere in the world. Where shall we go, love? How about the middle of the ocean? I have soap in my bag and the crazy notion in my mind that you'll clean up nice ... Johnny. 4. Shh. *looks around* You'll give away all my secrets. Who is the hero of your story most like: me (savvy, debonair, and unquestionably smooth with the ladies), the insufferably honorable Will Turner, or that deceptive little minx Elizabeth? 5. Being honorable can certainly cramp one's style. Still, if he's getting kisses from his girl, he can't be all that bad. Rum? Or more rum? Hammock. Umbrella drink. You can stay if you want. 6. Darling, I thought you'd never ask. Which leads me to the age old question: Why is the rum always gone? The rum is always gone because you drank it! I, on the other hand, am virtuous and noble and (hic) would never steal the last glug of rum! 7. My dear, I think you just may be the woman for me. What’s the most piratish thing you’ve ever done? Other than finishing off the rum? Okay, I confess. I'm mostly a good doobee. Soccer mom on the outside, pirate on the inside. Once on a road trip I threw the map out the window and took a random left in the middle of the desert. Didn't make it home for three days. That's about as wild as I get. 8. Stick me with, love. I'll help you bring out your inner pirate in no time. Are they rules? Or more like guidelines? They are guidelines. Perhaps only suggestions! Hints, even! 9. I understand you’re a story-teller. Any undead monkeys in your stories? No. I’m not fond of monkeys. They fling poo. I just can't get past the poo thing. I do like to bring animals into my stories. My current trilogy has a giant white horse named Balthazar with what we like to call an "attitude problem." His rider is of the opinion that an exorcism is in order. 10. Monkeys are filthy little creatures, aren't they? Any curses? Heartless monsters? Irritating women who insist on taking matters into their own hands? Ooh, curses sound like fun! No curses as of yet, although I did once write a heroine who was jinxed! The first line of that novel was "Another day, another suitor carried away in pieces." Heartless monsters--only of the human variety, but I have a good pile of those. Of course, they tend to end up in body bags. Irritating women with minds of their own? Every damn book and proud of it! 11. A jinxed heroine who leaves her suitor in pieces? *looks over shoulder* She wouldn't happen to be named Elizabeth, would she? One of my favorite words is “egregious.” Care to share one of yours, love? My favorite word is "hammock." Or hadn't you noticed? 12. I detect a trend. Let us finish this interview and go find a hammock for two. Parlay? Or draw your sword? I like parlay because I can argue the socks off a black-and-white cat! I can argue you into giving me your sword--wrapped up in Christmas paper with a glitter bow on top! 13. Darling, if you're holding my rum hostage, you can have my sword, my boots, and my almost-honorable heart. Hands off the hat, though. You’ve got a crowd of cursed sailors and a nasty sea monster on your trail. How do you escape? So the arguing didn't work, huh? Well, I'd like to see how the sea monster operates in the desert. Come and get me, SpongeBob! 14. SpongeBob? What an odd name. A cursed creature, no doubt. Romantic night in? Or adventure on the high seas? Can't I have both? Romantic night on the high seas? Adventure in? Come on, Jack, use your imagination! 15. Why bother? It's so much more fun letting you use yours. Just pass the rum. My personal motto is: Take what you want, give nothing back. What’s yours? My motto is "No apologies, no excuses." We make decisions in every moment of every day, even when we don't realize it. I try to make mine consciously, with a goal in mind, so that everything I do puts me closer to that goal. Whether I get there nor or is all on me. 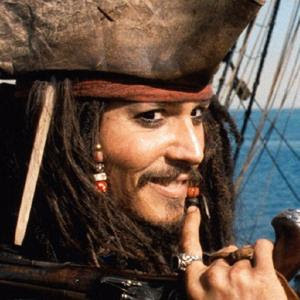 Sounds like we may soon lose Captain Jack to the enticement of Celeste's hammock and jug of rum! Thank you, Celeste, for the fun interview! If you haven't yet tried some of her novels, do it. And be prepared for a romp through Regency England. Of course, you realize there's more fun to be had! 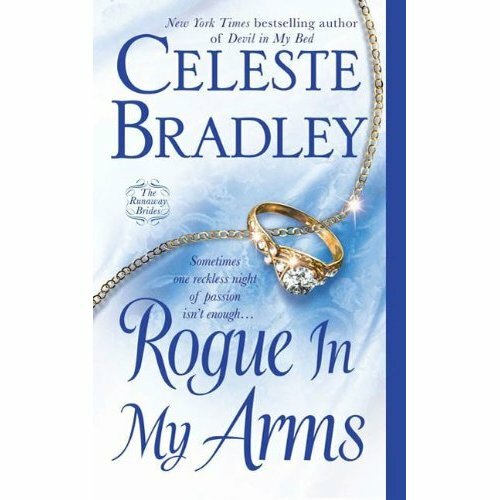 Celeste has generously offered to give away THREE signed copies of A ROGUE IN MY ARMS! Leave a link to your tweet or include @cjredwine in the tweet so I see it. Contest ends Sunday, April 11th at 8 p.m. Central Time. I will tally up the entries and use random.org to generate three winners. Good luck! I love the personal feel of this post and interview. How cool would it be to meet a real author!? Pirates, monkeys and cupcakes... what more could a reader ask for! Your book sounds great! I love the cover, too. And how kind to help a new writer like that. Very nice. Best of luck with many, many sales. Celeste, I LOVE that you drank all the rum. So sneaky! I am really hoping to win a copy of this enticing book so I don't have to pull a pirate act of my own and steal CJ's. I think the excerpt are excellent. I'd love to know which one of the young gentlemen the baby belong to hopeful not one of the old fellows. I'd also like to know why this young man is so set on finding a woman that everyone has loved--leftovers. I guess the old saying is true, sometimes we can't see what we have right in front of us. Both stories left me wanting to know more about them. I'm rather picky but i like these story lines so far. Good Job! Another awesome interview that had me cracking up the entire time. Thanks so much for shining light on these books--they sound amazing. I have heard the story about how the two of you met and I love it so!! And .. ALL the rum? "I'm a pirate. Definitely. I'm not really a member of anything. I can't bear politics. Or committees. I can't stand it when people talk things to death instead of doing something. It makes me froth at the mouth with impatience and I usually just go ahead and get it done while they're still talking! I guess you could say I don't play well with others!" We should start a support group! I'm right there with you sister! Hmm, pirates anonymous? Okay, I took a contest hiatus b/c I got tennis elbow from all the random.org hacking. Or was it athlete's foot? 1 - This comment got did. Celeste, the comment about the bar of soap? LOL! 2 - Some story about a Gordian knot... yes? Alex hacked it to bits b/c he couldn't loosen it. I believe that's 8 entries. (You know my blog address!) I'm back, baby. And in it to win it. Um... So is that 5 points? what an introduction, and what an interview!! Hee, great interview, Celeste! Way to put the captain in his place. Ooh, I love it! I read Celeste's first series. I think it was the first. They were really funny! 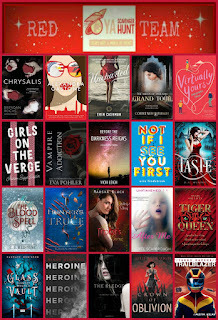 Would love to win a book! I can't figure out how to comment with my website showing, so I'll have to an anonymous and go from there. I haven't read any Celeste Bradley yet but would love to win a copy of this to try her out!